This article was last updated at 6:25 p.m. PT Monday, Dec. 11. Firefighters kept a wall of flames from descending mountains into coastal neighborhoods after a huge and destructive Southern California wildfire exploded in size, becoming the fifth largest in state history. Click here to see an interactive map of the evacuation zones. Thousands remained under evacuation orders Monday as the fire churned west through foothill areas of Carpinteria and Montecito, seaside Santa Barbara County towns about 75 miles northwest of Los Angeles. Much of the fire's rapid new growth occurred on the eastern and northern fronts into unoccupied areas of Los Padres National Forest, where the state's fourth largest fire burned a decade ago. The blaze had already destroyed 868 buildings and damaged another 187 in Ventura and Santa Barbara counties, as well as unincorporated Ventura County, officials said. It's just 20 percent contained after charring 231,700 acres of dry brush and timber. Officials warned that the number of buildings destroyed or damaged could rise, as could the current cost associated wit the fire, which as of Monday night stood at a little over $48 million. Forecasters predicted that dry winds that fanned several fires across the region for a week would begin to lose their power Monday. But the possibility of "unpredictable" gusts would keep firefighters on edge for days, Santa Barbara County Fire spokesman Mike Eliason said. Containment increased on other major blazes in Los Angeles, Riverside and San Diego counties. Resources from those fires were diverted to the Santa Barbara foothills to combat the stubborn and enormous fire that started Dec. 4. "This is the new normal," Democratic Gov. Jerry Brown warned Saturday after surveying damage from the deadly Ventura fire. 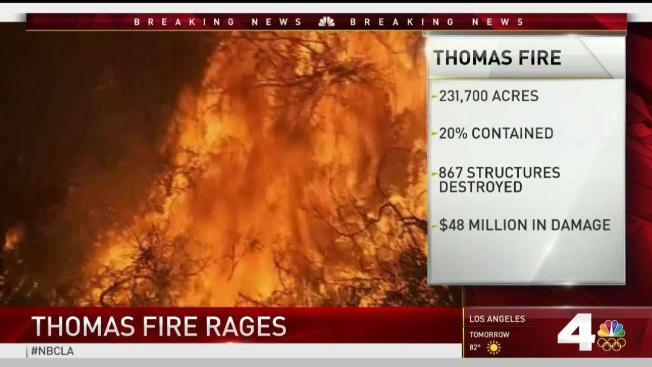 Brown and experts said climate change is making wildfires a year-round threat. "Our house is under threat of being burned," Ellen DeGeneres tweeted at midday Sunday. "We just had to evacuate our pets. I'm praying for everyone in our community and thankful to all the incredible firefighters." 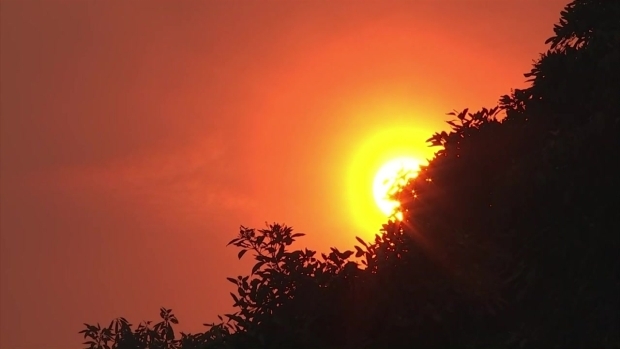 Ojai experienced hazardous levels of smoke at times, and officials warned of unhealthy air for large swaths of the region. The South Coast Air Quality Management District urged residents to stay indoors if possible and avoid vigorous outdoor activities. Despite the size and number of wildfires burning in the region, there has only been one confirmed death: The death of a 70-year-old woman, who crashed her car on an evacuation route, is attributed to the fire in Santa Paula, a small city where the Thomas Fire began. Evacuate to Ventura County Fairgrounds - 10 West Harbor Blvd., Ventura. Boundary of Hwy 33 on the north to Casitas Vista Road, northwest to Hwy 150, Hwy 150 (Casitas Pass Road) west to US 101 and south on US 101 (including Pacific Coast Highway) to Emma Wood State Beach. Sespe Creek to the west, Burson Ranch to the east, Fillmore City limits to the south, and Los Padres National Forest boundary to the north. Please call 866-EVRT911 (866-387-8911) for requests for assistance in animal evacuations. Large animal evacuations at the Ventura County Fairgrounds at 10 W Harbor Blvd, Ventura. Ventura County Fairgrounds (Red Cross - Includes an Animal Shelter for all types of animals) – 10 W Harbor Blvd., Ventura. Oxnard College Gymnasium - 4000 S. Rose Ave., Oxnard. Recreational Center (Includes an Animal Shelter for small animals - preferably in crates) 516 Ocean Road, Santa Barbara. The Red Cross has transitioned residents of the Nordhoff High School shelter in Ojai (1401 Maricopa Hwy, Ojai) to alternative shelters on Saturday, 12/9. The Red Cross Shelter is no longer set up in Santa Paula. A Community Distribution Center will open at the Santa Paula Community Center Tuesday Dec. 12 through Saturday Dec. 16 from 9 a.m.-5 p.m. to serve Santa Paula Residents impacted by the Thomas Fire. The City of Santa Paula partnered with the Salvation Army to provide food, water and other items to local residents in need of assistance. Santa Paula Community Center, 530 W Main St. Santa Paula.